Featuring a stylish appearance, the Samsung Galaxy A8 (2018) is cool to look at. It has curves that should make it comfortable to hold. The device seems like one to deliver impressive durability. With an IP68 rating, it is both dust and water resistant. 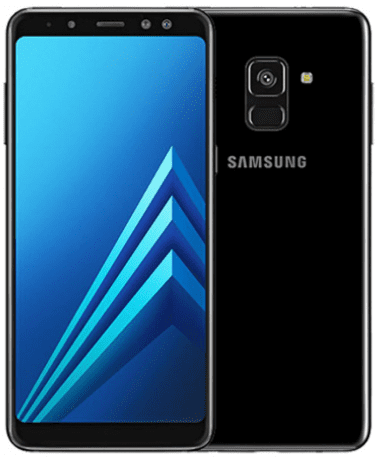 Samsung Galaxy A8 (2018) can survive in water depth of up to 1.5 meters – better than that of the iPhone X. This one offers ample screen estate for content viewing at 5.6 inches in diagonal size. The Super AMOLED panel boasts a Full HD+ resolution of 2,220 x 1,080 pixels. This is an Infinity Display with an impressive 18.5:9 aspect ratio, making for amazing wide-screen viewing. On the rear, you will find a 16MP camera with an impressive f/1.7 aperture, phase detection autofocus (PDAF), and LED flash. It boasts 78-degree field of view and Full HD (1080p) video recording ability. This new Galaxy A8 packs impressive punch with an in-house Exynos 7885 octa-core processor, featuring two 2.2GHz cores and six 1.6GHz cores, under the hood. The promise of truly solid performance gets better with 4GB RAM. Internal storage is 32 GB or 64 GB. You can use one of the SIM slots to add another 256 GB using a microSD card. Samsung Galaxy A8 (2018) ships with Android 7.1.1 Nougat OS. The Samsung Galaxy A8 (2018) offers a fingerprint scanner on the rear. This enables you use Samsung Pay in places where it is available. Still on authentication, you can also unlock the device with the front camera. Samsung Galaxy A8 (2018) gets juice from a 3,000mAh battery, which is comparable to what the flagship Galaxy S8 offers. Samsung promises talk time of up to 24 hours. Samsung Galaxy A8 (2018) is not officially available in Nigeria, Kenya, and Ghana, though the smartphone seems to have been launched in Malaysia for RM 1799. When available, you will be able to buy the Android phone at leading online stores in the countries. Samsung Galaxy A8 (2018) Price in Nigeria is expected to range from 165,000 Naira to 210,000 Naira depending on your location in the country. Its price in Ghana starts at around GH₵ 2,080. Samsung Galaxy A8 (2018) Price in Kenya starts at around 55,000 KSh.